Hold the RJ45 connector with the 'clip' on the bottom and have the 'opening' (where you insert the cable) facing you. In general, the patch cords that you use with your Ethernet connections are "straight-through", which means that pin 1 of the plug on one end is connected to pin 1 of the plug on the other end. In this particular case it is not then important to wire them as shown. Pin 1 is Pin 1 etc etc. 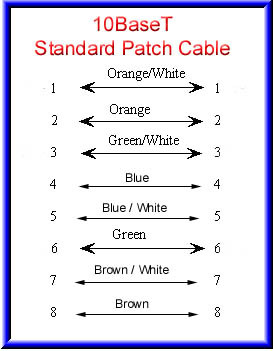 However for the sake of uniformity it may be best to wire your cables with the same colour sequence throughout. Cross-Over cables are "crossed" end to end data cables aren't. If you have a network hub that has an uplink port on it then you do not need to make. Just switch the port on the hub to the 'uplink' mode. If your hub does not have an 'uplink' port on it then the only way to cascade another hub or attach a cable modem is to use a cross-over cable. It helps for future reference to mark or attach a tag to the cross-over cable so that you do not attempt to use it as a 'normal' patch lead at some time in the future. The only time you cross connections in 10BaseT is when you connect two Ethernet devices directly together without a hub. This can be two computers connected without a hub, or two hubs via standard Ethernet ports in the hubs. 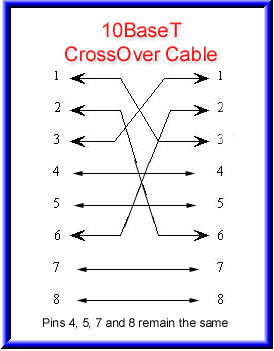 In a cross-over cable, one end is normal, and the other end has the cross-over configuration. Remember you can only network two computers together with Cat5 cable. To add extra PC's to your network you will require a hub.